While the holiday season is said to be bright, cheerful and merry, for people struggling with depression this can be the hardest time of the year. Whether it is a case of “the blues” or clinical depression, seeking out support and implementing a daily routine of self-care, including balanced eating, can help you back onto the road of physical and emotional stability. Experts point to various factors that make the holiday seasonal emotionally challenging. First, December is a time for self-evaluation and reflection, so financial hardships, unraveling relationships and mounting piles of work can cause feelings of hopelessness. Plus, there are the excess demands to make the holidays perfect while juggling stressful family dynamics. People lacking social support, especially elderly people who may be isolated due to health problems and those who have recently lost a loved one, are at increased risk for depression. In fact, the National Institute of Mental Health considers depression in those 65 years and older to be a significant public health concern. According to the Substance Abuse and Mental Health Services Administration, nearly 7 percent of U.S. adults and more than 10 percent of adolescents aged 12-17 have had at least one major depressive episode in the past year. A leading cause of mental illness, depression not only impacts the brain, but is associated with many other physical health problems. People who suffer from depression are four times more likely to experience a heart attack and, strikingly, are four times more likely to die within the following six months after having a heart attack compared with those who are not depressed. Depressed adolescents are twice as likely to become obese compared with non-depressed youth. A study published recently in the Journal of Affective Disorders found that weight gain in depressed adolescents is mostly a result of negative body image. Those who perceived themselves as overweight were twice as likely to be obese one year later. While seeking professional help is a key part to treating depression, healthful eating and nutrition can play a useful role in getting better and hopefully finding some holiday joy. Seek balance when enjoying holiday comfort foods. Keep portion control in mind when it comes to higher calorie holiday foods so you can eat your favorites without feeling guilty or deprived. Choose nonalcoholic beverages. Remember that alcohol is a depressant, so steering away from the booze at holiday gatherings can help keep your mood more stable. Low vitamin D levels are linked to depression. Since a primary source of vitamin D is from sunlight exposure, it can be extra challenging to get adequate vitamin D during winter months. Go outdoors to increase your daily dose of vitamin D.
Choose foods rich in omega-3 fatty acids. These essential fats from such foods as salmon, walnuts, flax seeds and extra virgin olive oil help reduce inflammation and support brain function, including memory and mood. Don’t skip breakfast. Including a balanced morning meal with protein and fiber, such as eggs and whole grain toast, can aid with mood, memory and energy levels. Make whole foods your base. Eating plenty of nutrient-dense whole foods will help ensure you are taking in the important nutrients needed to make neurotransmitters including amino acids, vitamins, such as vitamin B12 and folic acid, and minerals, such as zinc and iron. LeeAnn Weintraub, a registered dietitian, provides nutrition counseling and consulting to individuals, families and businesses. LeeAnn can be reached at RD@halfacup.com. It is estimated that SAD affects nearly one half million Americans each year, with women more likely to suffer from seasonal depression than men, and younger adults more at risk than older adults. Those who live furthest from the equator are more likely to experience SAD. Research suggests that SAD is triggered by a reduction in the amount of sunlight or daylight, which upsets the body’s natural clock. 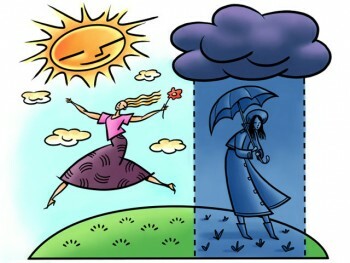 A change in seasons can affect production of the hormone melatonin, which plays a part in regulating sleep and mood. Reduced exposure to sunlight can also negatively impact production of the serotonin, a neurotransmitter that affects mood. Although diet and sedentary lifestyle are not risk factors for developing SAD, studies on depression suggest that those with diets low in certain nutrients, such as vitamin D and omega-3 fats, may be at greater risk for depression, and symptoms often improve when intake of these nutrients is increased. Additionally, individuals who eat a diet high in refined carbohydrates and/or lead a sedentary lifestyle may experience worse symptoms associated with SAD, especially weight gain, lack of energy, and fatigue. Increase your intake of omega-3 fats from salmon, sardines or other fatty fish, grass-fed beef, walnuts, flax seeds, soybeans, and enriched eggs. Omega-3 fatty acids play an important role in brain health. Although most studies examine their effect on mood disorders and other types of depression, several reviews of population studies, including those in Finland and Iceland, showed a negative association between fish eating and depression, including seasonal depression. In addition, researchers have found an association between lower plasma omega-3 levels and depression, and improvements in depression when subjects received supplemental doses. Make sure you get adequate vitamin D by exposing your face and arms to sunlight for 10 minutes each day, eating fatty fish, eggs, and fortified milk, and taking a vitamin D supplement if necessary. Vitamin D plays many important roles in the body, and studies have found a negative association with depression. In a study that examined the effects of adding vitamin D to antidepressant treatment in subjects with major depressive disorder, researchers found that adding 1 500 international units (IU) of vitamin D to treatment was superior in treating depression. Although much research has established an association between low levels of vitamin D and higher likelihood of SAD, studies on the benefits of using vitamin D supplements alone to treat SAD have been inconsistent. Eat a healthy, balanced diet that includes several servings of fruits, vegetables, whole grains, low fat dairy foods, fish, and lean proteins. Plant foods especially have beneficial nutrients and phytochemicals that may play a role in regulating mood, body, and brain health. In a review of 21 studies that compared dietary patterns to depression, Lei et al found that individuals with low intake of fruits and vegetables had higher odds of depression. The researchers also noted that although it has been difficult to establish the role of individual nutrients in preventing or treating depression, it may be possible that the various nutrients contributed by an overall “healthy diet” act synergistically to prevent depression. Choose complex carbohydrates over refined carbs. One of the symptoms of SAD is an increased craving for carbohydrate foods. 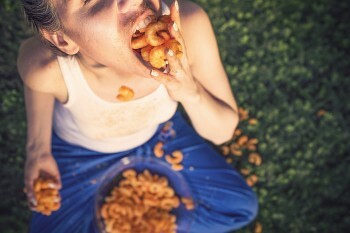 Unfortunately, filling up on sweets, pasta, and other refined carbohydrate foods causes a spike in blood glucose and insulin levels, and often leads to weight gain and fatigue. In addition, research from the Women’s Health Initiative found that higher glycemic index foods actually contribute to depression, especially in postmenopausal women. Choosing more high fiber, whole-grain carbohydrates such as oatmeal, brown rice, farro, or whole-wheat pastas helps to regulate glucose levels, and supplies a steady supply of lower calorie energy throughout the day. Aim for exercise most days of the week. In addition to helping to prevent winter weight gain, regular aerobic exercise, for at least 30 minutes each day has been shown to improve mood and reduce both major depression and seasonal affective disorder. Exercising outside in sunlight has been shown to have even greater benefits. So often, we think of nutrition and its relationship to our bodies from the neck down. How it affects our heart, how it affects our colon, for example. Why do we not acknowledge its impact on our brain health as well? If a patient were to undergo an elective surgical procedure, he or she may be advised to lose weight, gain weight, or avoid certain medications or herbs beforehand. These recommendations are made to help ensure maximum recovery with minimal complications. Why would we not take this approach when dealing with mental illness as well? Shouldn’t we try to achieve optimal nutritional health of the brain if we are trying to heal it? A poorly nourished body contains a poorly nourished brain. It has been my experience that clients who take the nutritional component of their mental health or substance abuse recovery/rehabilitation seriously, are more likely to be successful and experience “wellness” in their mental health. A more holistic approach is necessary. It is essential to treat the body and mind as one. The brain does not live in isolation to the rest of the body. More and more medical experts are realizing that every biochemical reaction in the brain occurs as a result of the nutrients we feed that brain. Mental illness needs to be attacked with various approaches, medical nutrition therapy being one of them. One of my favorite quotes, and one that I truly believe in, came from Hippocrates when he said, “Food is thy medicine and medicine is thy food.” Whether we are treating substance abuse, depression, bipolar disorder, ADHD, or schizoaffective disorder, we need to focus first and foremost on proper nutrition for the brain. 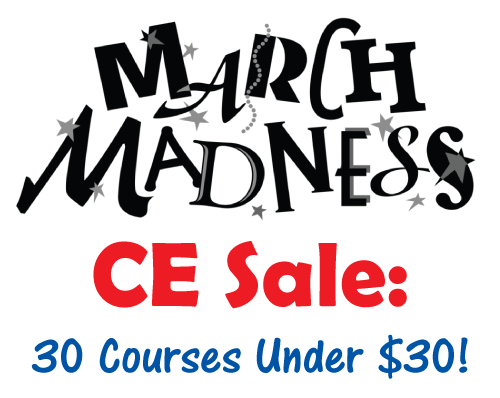 Nutrition in Mental Health is a 3-hour online continuing education (CE/CEU) course that discusses how good nutrition impacts a person’s mental health and well being. Includes discussions on “mental wellness” versus “mental illness,” hypothyroidism and it’s impact on mental health, neurotransmitters and amino acids, glycemic index, vitamins, fatty acids, caffeine, chocolate and aspartame, and herbal supplements and medications. Case studies are provided. 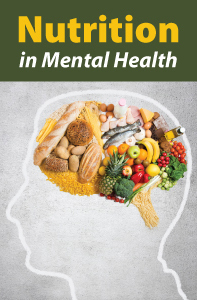 This course will give the reader some insight into this concept, by providing the student with clinical research, anecdotal information and a good background for understanding the role nutrition plays in mental health. Professional Development Resources is approved to offer continuing education by the American Psychological Association (APA); the National Board of Certified Counselors (NBCC); the Association of Social Work Boards (ASWB); the American Occupational Therapy Association (AOTA); the American Speech-Language-Hearing Association (ASHA); the Commission on Dietetic Registration (CDR); the California Board of Behavioral Sciences; the Florida Boards of Social Work, Mental Health Counseling and Marriage and Family Therapy, Psychology & School Psychology, Dietetics & Nutrition, Speech-Language Pathology and Audiology, and Occupational Therapy Practice; the Ohio Counselor, Social Worker & MFT Board; the South Carolina Board of Professional Counselors & MFTs; and by theTexas Board of Examiners of Marriage & Family Therapists and State Board of Social Worker Examiners.